Going down the more aggressive side of the progressive metal spectrum, with razor-sharp riffs that wouldn’t be out of place on a Megadeth album and which perhaps betray the band’s original thrash roots, are Finland’s Malpractice. Formed as long ago as 1994, surprisingly, the quintet released three albums before linking up with Sensory earlier this year and knuckling down to ‘Turning Tides’, their first worldwide release. So far, so metal, but what makes Malpractice a very interesting proposition indeed is the fact that although their songs don’t shy away from being heavy, they are still extremely catchy, enormously accessible, and vocalist Aleksi Parviainen’s range – comfortably encompassing both a silky-smooth melodic delivery and a contrasting heavier growl – gives them an added depth. This is a band that wants to push barriers and buttons, and as such ‘Turning Tides’ races along at a cracking pace, driven by the twin guitars of Joonas Koto and Marcus Vanhala and backed up by the forceful rhythm section of bassist Jonas Maki and drummer Toni Paananen. There’s a lot to shine the spotlight on, like the attention-grabbing riff of album opener ‘Best Kept Secret’ which I could personally listen to all day, and the Metallica-inspired chugga-chugga battery midway through the Megadeth-soundalike ‘Weight of The World’, and if the world’s going to end in seven-and-a-half minutes check out ‘Out’ which pretty much sums up everything the band’s about. Variation within this riff-monster come with the outrageously progressive finger-knotting instrumental ‘Sympathy Of Urban Discomfort’ and the title track on which the guys take the foot off the gas for a while, although as a quick glance at the CD case reveals a running time of 15 minutes you know it’s a song that’s going to take off and fly at some point – although it does like to tease before finally letting go. To be honest, this one track – half the length of an early Kiss album – is worth the price of the CD alone. 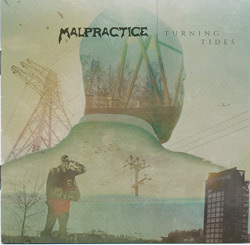 It will be interesting to hear what Malpractice do next, because if they can keep delivering material as exciting and stimulating as this they’ve got the potential to go all the way.